I read the above Tweet and decided to investigate. Why should American military officers learn foreign languages? For that matter, why should Foreign Service Officers or any other representatives of the American government? And whilst the context of the article is military, considering the situation in Afghanistan and Jordan, the comments Reach makes are relevant to language learning in general, not just in volatile situations. I still believe learning human languages the old fashioned way is important. Why? This is the crux: foreign language ability is not just about converting information from one format to another. It’s about human relationships. He talks of language as ‘a way of building relationships, of winning trust.‘ Couldn’t agree more. How many times have I been met with a beaming smile and extra special attention because I spoke in Spanish, French, Catalan, or even when I attempted to speak German in Switzerland? I see it as a mark of respect to attempt to communicate in someone’s language, even if it is a job to get your mouth around the sounds and intonation. I’ve mentioned before that some of my favourite and most rewarding teaching experiences have been when pupils have led, sharing their experiences and language with joy and pride – and been amused by my efforts! Language is extremely hard. 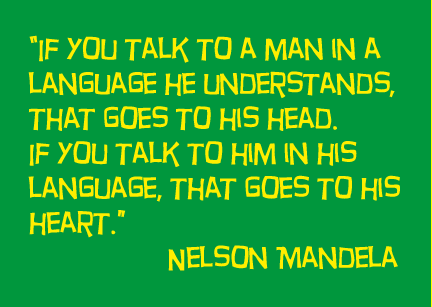 We need as many language solutions as we can get, and technology certainly can and should help fill the gap. But no matter how good the technology gets, no matter how prevalent English becomes, old-fashioned speaking of a foreign language still matters. 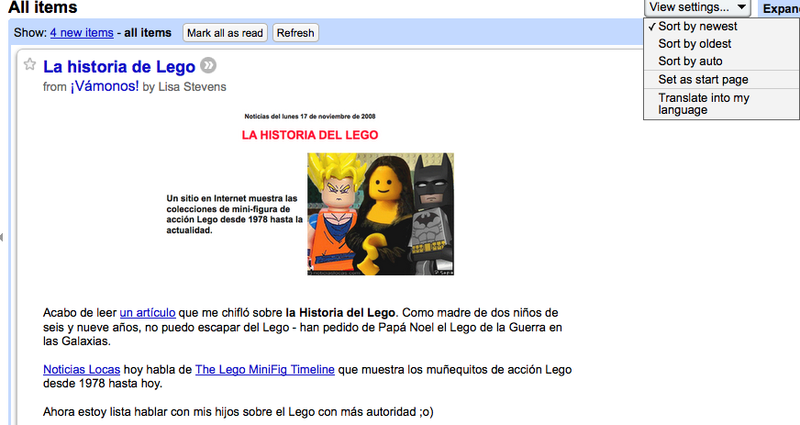 I have been criticised before for ‘posting in a foreign language’ on ¡Vámonos! A little harsh, I felt, as the blog is subtitled ‘Teaching and learning Primary Languages in the 21st century’. (comment to that effect has been deleted from the post!) 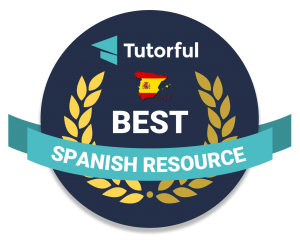 However, I am aware that there are readers who do not speak Spanish or Catalan, the two main languages (other than English!) in which I blog. Since its inception, ¡Vámonos! has had a ‘translate’ widget in the right hand sidebar for just this reason, and I recommended the use of Google Translate last year. Last week, I discovered that Google Reader now offers the opportunity to have your reading translated into a language that you understand. So, if you have subscribed to my blog using GoogleReader, and didn’t understand a word of the previous post, this is for you! Go to view settings…select ‘Translate into my language’ (that is the language that you have set as default for your reader) ….. 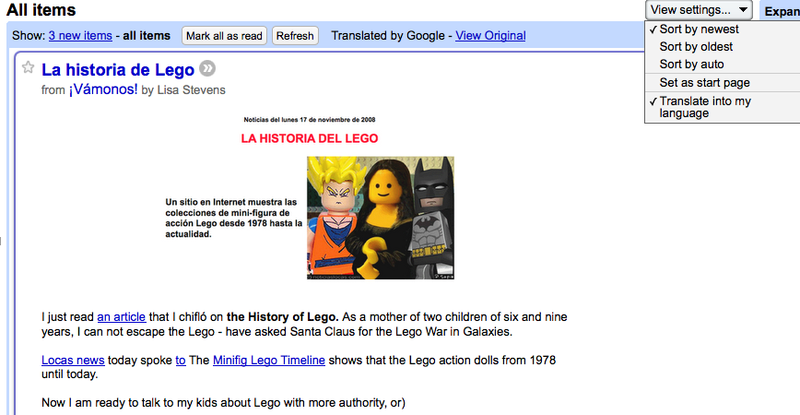 The translation isn’t perfect – me chifló seems to have it stumped! – but you can get the gist!